System.NullReferenceException: Object reference not set to an instance of an object. at Quester.Bot.Bot.Pulse(Boolean loadSettingsProfile, String profile) Usually an indicator that you are trying to load a Quester profile as a Grinder. Or your profile was corrupted upon download. Re-download the profile. Your profile should be 39bytes, sometimes rocketr doesnt update Immediatly after an update and gives you a 0kb file. If the problem still presists, make sure you have "QUESTER" Selected as your " Bot Type ". If none of thoes work, contact @Andoido @[email protected]@Matenia for a more complete troubleshooting. Steps 1 and 2 should fix it however. Each Rocketr ID is meant to be ran on only 1 IP. If you do run it on 2, you will get an error. Contact me if you need multiple licenses. Buyers may only run up to 10 instances at one time per Computer. (You may run unlimited wow.exe's using different IP's by using a VPN or Proxifier) Using the same Rocketr ID on more than one Wrobot Key can result in a temp ban. If you need more than 10 instances of this profile running at any given time, send me an PM l and we can setup a special discount rate. Buyers should get on my Discord channel to see when I release an update. Automatic Updates - When you click "START" the bot will check if there is a new version of the profile available, and re-download. If you prefer doing this yourself - Redownload the profile via your Rocketr EMAIL link. Over 450+ Quests - closer to 500. Each profile has a "LoadProfile" code, at the end of it to load the next profile in the list. All starting areas included - No Authorization needed. Class Quests (Included in the 1-13 profiles) And in the 13-30 profiles. Bot will automatically detect if you are in the correct zone, and if not will take a Ship. All ship codes implemented (Booty Bay is the main ship code used.) TBC Ready - I included code for TBC Users. In TBC Wrobot has problems with "Gathering" or "Use Item on" quests. I have included Code that will fix this error. The code will work for Vanilla aswell as tbc/wotlk. Huge blacklist database. Vendors for all zones the bot uses. I based the focus to do quests that were Green, or low yellow. So your bot will grind yes, and it will then do the quests. Will automatically remove items that are not sellable, and are taking space in inventory. Custom Bot settings on start - If you wish to use your own settings uncheck box #3. Custom Do Not Sell list - Upon starting the bot, every single time, it will add a huge. do not sell list to the bots database. You can turn this off by unchecking box #4 Removed the "On Screen Display" --- Please use "Whats Going On" Plugin. Added custom chat text for certain events. Mailboxes were added in each area we go to. Bot will abandon quests using custom scripts (same as deleting items - TY FNV) Bot will get ALL flight paths that are near it - Custom code, to run and click the NPC. Bot will use Custom Fly code's to fly - If for some reason this doesnt work, WTrainer will take care of it! 1-13 and 1-23 Night Elf Included 1-13 Gnome Included 1-13 Human Included Please report any BUGS to me involving broken quests. Combine all "Blackspots, and Blacklisted NPCs" to each profile. Add 55-60 quests Fix any bugs reported to me! Download the Profile. Place the profile .xml inside of the " Wrobot / Profiles / Quester " Folder. Load up Wrobot. Select Quester Bot , in wrobot. Select the profile in the drop-down menu. Click Start. Done! (You may run unlimited wow.exe's using different IP's by using a VPN or Proxifier) Using the same Rocketr ID on more than one Wrobot Key can result in a temp ban. If you need more than 10 instances of this profile running at any given time, send me an E-Mail and we can setup a special discount rate. All buyers must manually update by re-downloading the profile on Rocketr. The file will be updated/re-downloaded via the E-Mail sent upon purchase of the profile. Buyers should get on my Discord channel to see when I release an update. Future Updates will be AUTOMATIC Very Soon! A new technique was used in this profile, for quests that give KEY gear and Weapons. The bot will do the beginning quests in the chain (Even if they are Grey) in order to achieve the final quest. If you are level 29 for example, and buy the profile and start for the first time, no doubt the bot will do many other quests. But a main quest in Stonetalon for example, has 8 pre-requisite quests starting in Ratchet. The bot will do every single quest (even the grey ones) in order to get this final quest which rewards a huge upgrade for the bot. Over 350 quests from 1-60 Automatic Updates Randomized Timer! - Each time the bot grinds, it will Re-Select a grind spot every X minutes! This is going to prevent bans and groups of botters! All class quests up to level 60. Randomized grinding locations - Auto selection upon starting the bot. (Forced timer code coming soon) New code to detect if you have a certain pet spell. Auto detection of weather the bot has bought the custom Vendor Weapon or not. Bot will Bind his Hearthstone. Use of Hearthstone several times 100% AFK Botting - There should be no need to check or uncheck quests. Bot will use Zepplins. Bot will use Ships. On-Screen Display to show what the bot is doing. (Note, whats on the screen is not Exactly what the bot is doing, but a general overview.) New On-Screen-Display Box! On-Screen chat messages to emphasize important events, this was added for you (the buyer's) benefit. 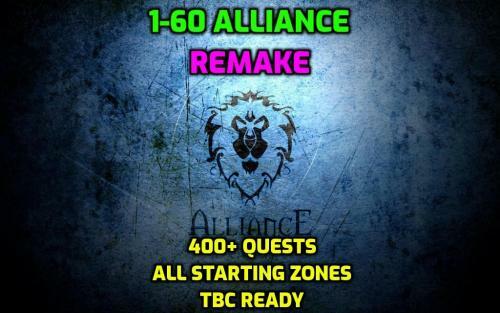 Undead + Tauren + Orc/Troll starting zones included. Tons of Blacklisted areas and mobs to prevent dying. All Class Quests. Automatic buying of Weapons at 7, 13, 16, 21, 30 etc. Bot will buy all warlock books and use them. Bot will buy items off Vendors for Quests. Automatic level detection. The bot will see what level you are, and start the bot on that level ranges quests. Undercity and Orgrimmar Weapons Master training at level 10-11. Bot will learn Skinning. Automatic buying of Skinning Knife. Custom Wrobot Settings modification + "Do Not Sell" list upon starting the bot, or reaching a specific level. Bot will Automatically turn on Skinning and turn off Ninja Skinning each time you start the bot. Bot will learn First Aid. Bot will Auto-Train skinning throughout the profile. Bot will Auto-Train First Aid throughout the profile (Bot will grind x ammount of cloth, and will farm and train at certain levels) Huge grinding hotspot list to prevent bot trains and bans. 85% of quests have a secondary redundancy to make sure the quest gets completed correctly. Improved loading time's with more "If" statements. Custom pathing on long journey's and quests to prevent dying. Possibly adding Auction House support, to buy weapons + gear on Auction house (Awaiting help on this.) Add several new grinding locations for specific levels, so its not all same zone. Force warlock to buy more books, clear up code so it auto checks without having to make several IF statments. Add any final class quests ( if i missed anything above, please let me know asap!) Add more code to buy weapons at higher levels. Possibly add vendor support for Armor. Blacklist more groups of mobs in the zones we are grinding. 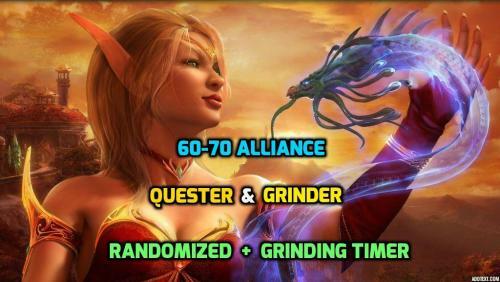 This is my 1-60 Alliance Quester/Grinder - Avg ammount of Quests is 100-150. If your looking for a quester with way... way more quests, and work. Please check out my new profile. Randomized Grinding - What is it ? The profile will randomly select a grinding location each time you start the bot. So there is no guarentee you will continue grinding in the same spot if you stop the bot. Automatic Updates! The bot will check for a new updated version each time you click start. Over 90 Quests included. Will do several quests per level group and then go grind. 100% AFK Botting - Meaning you shouldn't have to do anything to the bot. Randomized grinding locations- A new technique that has been getting a lot of popularity because it reduces bans by a lot. Automatic level tracking - Bot will detect level and start doing the quests. 1-23 Night Elf starting zone supported (Will go to Wetlands at 23.) 1-14 Gnome starting zone supported (Will fly to IF and take Tram to Stormwind, then continue.) 1-60 Human starting zone supported Ship usage : (Darkshore - Wetlands)(Wetlands - Theramore)(Theramore - Wetlands). Custom flight path System (Code will force learn new flight paths, and use them). Druid Bear Form Quest. Warlock Voidwalker Quest. Human Warrior Quests (lvl 30) Tram support for IF-SW and SW-IF. Automatic buying of Weapons at level 6/7 (More levels to be added). Automatic Weapons Master training (Darn, IF, SW). Will learn Herbalism (Night Elf's) Will learn Skinning (Doesn't enable it. You have to do this manually.) Custom pathing on longer quests to prevent dying. Huge hot-spots to prevent bot trains and bans. On-Screen display that shows what the bot is doing. On-Screen chat messages for important events. Custom Run-Code to modify Wrobot's base settings. Will use Hearthstone. Mining 1-300 Random Zones Add grinding locations in different zones (means i have no control over the "Set" path he will take). Add "buy Weapons" support for higher levels based on the minimum ammount of silver you have. Add more quests. Grab a paid fight class from @Matenia Grab HumanMasterPlugin from @Matenia if you plan to run to 60 Put 50+ silver on your char so he will buy weapons! Buy yourself a green weapon ! (if you buy a weapon manually, be sure to uncheck between If and Endif in the settings) Get skinning at level 6. This helps with $$ Search Radius of 77 Use Profile Vendors Only turned On. (Turn off in HMP too) Inside Human Master Plugin - Turn off "Blacklist groups and Highlevel mobs" and "Use Smart Pulls"
Please report any and all bugs or errors to me promptly! Rate and Comment below, thanks guys. Automatic Updates (Coming next patch) Randomized Grinding with a 40-60 minute timer when grinding. I have included a Timer that will start the moment the bot starts grinding. And when the timer is up it will Re-Select a new grinding location. This is to prevent bans, and bot trains, etc. You can expect great things from this new feature ! (Horde + Alliance 1-60 will be getting it soon.) Over 280 Quests in the profile. All hand done. "Interact with NPC or Object" Quests have their very own RunCode because TBC is odd when it comes to Wrobot. Dozens of custom codes to make sure each quest is done proper. Level Restrictions - To speed up load times. There are 4 level RunCodes that will be ran if the bot meets the specified requirements - he will do the following quests. You can turn this off by unchecking the code if you want the bot to do everything (green quests etc). Bot will automatically Remove quests from the Quest log due to Auto Pickup. Usage of Hearthstone, several times. Automatically bind you when you reach a new questing area. Bot will pickup key Flight Paths - Custom code. Zangermarsh Elevator - I implemented a special code just to get the Flight Path in Zangermarsh, And will do the same for Netherstorm Elevator next update. Bot will fly automatically. On-Screen Display to tell you what is happening at "KEY" points of the profile. In order to improve load times, i will not be placing this for each quest. Custom blacklisted Areas + Mobs. Detects if you have 300 skinning, and will automatically level up at the trainer. Do Not Sell List - I've implemented a custom code at the beginning of the profile to prevent the selling of several valuable items that could net you some awesome gold / Reputation. Profile is mostly questing. In the event that you must grind - There are 4+ grind spots the bot will choose from for each level range. Many private "Follow Path" codes to prevent the bot from dying. Download the Profile. Place the profile .xml inside of the " Wrobot / Profiles / Quester " Folder. Load up Wrobot. Select Quester Bot , in wrobot. Select the profile in the drop-down menu. Click Start. Enter Rocketr ID - Hit Enter Done! [PAID][HORDE] 1-300 Skinning 100% AFK - It does it all. I am releaseing my 1-300 Skinning Profile today! This is a very advanced profile, and i dont expect there to be any bugs what so ever. You can stop this profile at any time, and start it and it will pickup where it left off. Future Updates will be AUTOMATIC Very Soon! Will automatically TURN ON Skinning, and TURN OFF " Ninja" Each time you Start the profile. Each spot was chosen based on location and mob avalability. Will automatically train Will automatically buy Skinning knife Will automatically Add items to Do Not Sell list. Will Run your character to each spot instead of forcing wrobot to make a path. Thousand Needles elevator Support Will use custom code to FLY when needed Will gather all flight paths on its way, even if you have them. Download Put file into "Wrobot / Profiles / Quester" Folder Load bot. Select Quest Bot Select file. Click start. Done! 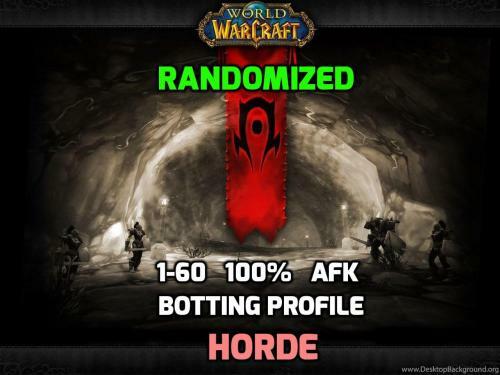 I have put many many weeks of hard work into my Horde 1-60 Randomized profile, and have saved over a dozen profiles from that adventure that i am releasing FREE to the public today. All profiles were created with the 100% AFK Assumption in mind. Below you can find a detailed list of what is included. I really hope you like what you see! Anybody can use my profile code, I just require that you give me credit where credit is deserved. All profiles listed were made by me and as such are "UN ENCRYPTED". If you wish to use the code in the profile you are required to list me as the owner/creator of said code. I ask nothing in return for all of this hard work, except that you respect the amount of time and energy i spent putting into them and not abuse my wishes. All profiles are 100% AFK. 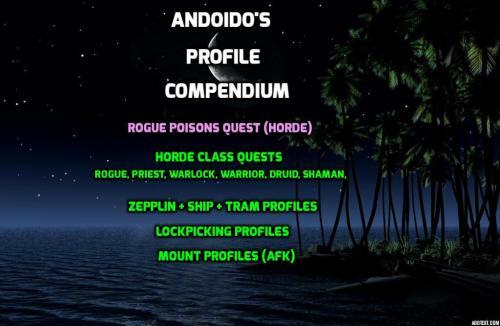 Horde Rogue Poisons Class Quest - By far the hardest class quest and nobody has been able to give a working release till now. Shaman Totem Quests (Earth, Air, Fire, Water) - Troll / Orc + Tauren. Level 5 UD Priest Level 10 Priest Quests Warlock Undead Voidwalker Quest Warlock Orc Voidwalker Quest Warlock level 20 Succubus Class Quest Warlock Level 30 Felhunter Class Quest Warrior Level 10 Defensive Stance (Orc/Troll + Undead) Warrior level 30 Berserker Stance Class Quest Druid Tauren Aquatic Form Class Quest (UNFINISHED) Druid level 10 Bear Form Class Quest (Tauren) Level 45+ Mount Vendors ( Bot will automatically detect race / level) - Required 110 gold. Zepplin Profiles -- Org to Gromgol, Org to Undercity, Undercity to Org. Ship Profiles - Darkshore to Wetlands, Theramore to Wetlands, Wetlands to Theramore. TRAM Profiles - Stormwind to Ironforge, Ironforge to Stormwind. Lockpicking Profiles. And thank you @Droidz for such a great bot! Heyya. This is my Gnome / Dwarf 1-14 that i modified from my new alliance profile. I put a good few days into this profile and I hope to see all positive remarks. This is profile #1of several I will be uploading this week. Hope you like it. On-screen display, to show what the bot is doing. No "Checking and Unchecking" of Quests. Customized to be completely afk. Start at any level and it will auto find where you need to go. Weapon Support - Bot will manually buy weapons at Level 7 and 14. Flight Paths - Run-code to pick all FPs. Bot will pickup Skinning. Weapon Master Training (Ironforge And Stormwind.) Deeprun Tram support. Hearth-bind in Kharanos. Will do all starting quests, and then move to next area. Most quests will be 1-2 levels below, so bot doesn't die. Vendor / Repair / Trainer Support. Profile will change bots base settings as well. Will buy items from Vendor, for specific quest. Custom pathing for long runs to avoid deaths. 1) i recommend using HumanMasterPlugin - by Matenia. 3) I prefer setting my bot to 88 Search Range. 5) Melee Classes - Get MoveDuringCombat by Droidz. I have spent countless hours on the work you will be seeing soon this week. I just ask that if you find Any bugs, or any problems say something. This will in turn help me release a profile without flaws! I would like to throw a shout out to @[email protected]@[email protected] for various things. I got the idea for weapon support from Eeny, Matenia guided me with some ideas, Maylu's idea behind TrulyAFK and droidz for making anything we do here possible. Please don't forget to rate / comment about it! Hey all. Here is upload #2 of several. This is my Night Elf Starting zone + level 23. I am aware there is a profile by @eeny already up, but i did put the work in on this and wanted to share. I put a lot of work into this profile, and i would ike to thank @Eeny for his druid bear form. This bot should be used with Questbot, and if you find any bugs, or repeated deaths i would hope you report it! Will do starting quests, travel to the 6-11 area, do quests, buy weapon go to darnassus, train weapons, run through portal, fly to darkshore, and quest / grind to 223,, then hop on a ship from Darkshore to Wetlands. This is an early release, i expect there will be bugs or issues and i would love to hear about then. 1-23 Fully Automatic - Should beable to start the bot and not intervene. Same as Starting and Stopping. Automatic level tracking - Bot will detect level and start doing the quests. Bot will pick grinding spots at random. Ship usage - Darkshore -> Wetlands. Flight Path usage (forced flying.) Druid Bear Form Quests. Automatic buying of Weapons at level 6/7 ( I plan to add more vendors at higher levels.) Automatic Weapon Master Training. Will learn herbalism Custom pathing on longer quests to prevent dying. On-Screen Display that shows what the bot is doing. On-Screen Chat Messages, for important events. Custom Run-Code to modify Wrobot's base settings. My horde 1-60 + random grind spots is halfway done. I am hoping i get to sell it - My question to you, What would you like to see in a Quester+Grinder profile ? Like if you bought several other users profiles, and wanted to add something specific what would it be? Let me know! Working Ship scripts i built that work everytime! Wetlands -> Theramore Theramore -> Wetlands Darkshore -> Wetlands Will Board ship, wait till it reaches dock, and backup off the ship into the water. Please Rate and Comment below! I extracted the code i have for Deeprun Tram for thoes of you who are creating profiles and are having a hard time this is a great example. I modified this a bit to fit my needs and i hope this helps anybody who needs it. Bot will use the MIDDLE Tram Cart always. Keep that in mind if you wish to use this. Chat display showing what the bot is doing 2 Files - Stormwind -> Ironforge and Ironforge -> Stormwind. Trains at Weapons masters in IF and SW Also has On_Screen display to show the bots movements. Will only board tram if its within 30 yards. Will turn off "Close bot if teleported" when Entering or Exiting the portals. Will run to Weapons Master Trainer (But will not train) If you wish to add weapons master training, just add simple runcode/lua to click the popup buttons etc - easy to find on Wrobot. Please remember to rate and comment below! @ScripterQQ Who built a profile for all of the training. His code is what i use and modified a tiny bit, all credit for it goes to him.